A self titled product and make up junkie shows you how to live lavishly on a not so pretty budget. So I've been really busy and haven't had time to open my Glam Bag for this month, until yesterday. First of all, it comes in a girly pink metallic bubble envelope mailer, so I have no idea how I resisted opening it for this long! The little bag the stuff comes in is really cute, and from what I hear, there will be a different bag every month! Yay! I think I will definitely use them to keep some make up in the car, at the office, to organize other makeup, etc. I was also surprised it had a built in mirror! Nice touch. Okay so moving on! 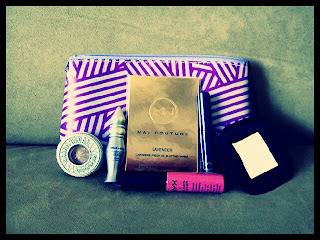 What I love about this month's items is that they are GREAT make up bag staples; a great starter bag for people just getting into make up and tuning into these YouTube Guru's like Michelle Phan and Promise. But what I really really love, is that this bag comes with not one but two FULL SIZED SAMPLES worth $30!!!!! 1. Mai Couture Lavender Oil Blotting Papier *Full Size* 100 Sheets MSRP: $13 (without the wallet you put it in). I found this to be very fancy, luxurious and actually very useful. Blots up my excess oil and leaves me camera ready. Don't know if I will be buying it again, since $13 is a little pricey for me, but I'm glad to have tried it and who knows, when I'm down to my last sheet I might be crying for more. 2. NYC Soft Matte Lip Cream in "Milan" LOVED THIS. Rose pink color freshened up my tan skin and the feel is just so silky, feels like you dressed your lips in satin. Tip: If you tend to have dry lips, first use your toothbrush in the morning to lightly exfoliate them, then glide a non-greasy lip balm first. I will definitely be buying more shades of this! 3. Tarte Light's Camera, Lashes Mascara - I actually have the full sized version, and I loved it at first, but it dries up pretty quickly and loses it's oomph over time. But it really does a great job coating the lashes and makes them very voluminous. (Great as a sample size though, as I love to having a spare makeup bag everywhere). TIP: What I've been doing to extend the life, is microwaving for a minute in a cup of water. If you haven't tried that trick yet, try it! 4. Urban Decay Eyeshadow Primer Potion - A BEAUTY STAPLE. I am so happy I have this, because I cannot put on eye shadow without primer anymore. This primer helps your eyeshadow stick to your lid without any greasiness or midday creasing. It doesn't get better than this. 5. Urban Decay Eyeshadow in "Sin" *Full Size* .05 oz MSRP: $17 - I've always loved Urban Decay...but not their prices. This is the perfect natural shade you can wear daily. The color is a pinky-golden champagne and really complements the skin. Great as a highlighter or all over base color. Very versatile. Last sample which is not really part of the main samples, is Mai Couture "Blush In A Rush" Papiers - which is pigmented paper with a bit of shimmer. A sheet in "Sunset Blvd" was stuck to a postcard. I was very curious about the application. Tried it this morning and I don't like it. Feels weird to apply and I could barely see it on my cheeks. Those are my thoughts on the December Glam Bag! Hope you enjoyed reading. Comments are always welcome!